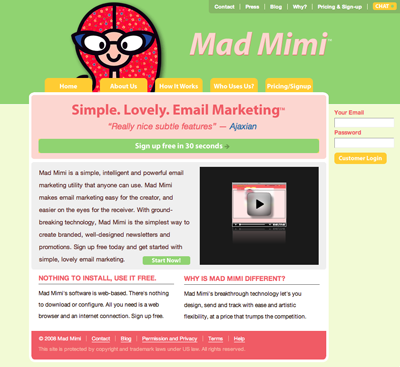 MadMimi.com is a Brooklyn-based startup providing "a uniquely simple, powerful email marketing service." They utilize Basecamp and Campfire for in-house collaboration on development projects and as their main platform for customer support. Gary Levitt, co-founder of Mad Mimi (that's him in the picture to the left, along with his wife, Leah, also a co-founder), tells us more below. Well we must have referenced Basecamp a hundred times during the conception of Mad Mimi. So to say we like Basecamp is a bit of an understatement. Basecamp helps us handle project collaboration effortlessly. But our affinity goes deeper — Basecamp's simplicity was a muse for us, in that it triggered a shift in our mindset which lead to the creation of our product. Others can debate the logic of this, but to our minds, when you cross Basecamp simplicity with email promotion, you get a fresh, functional alternative to the bloated, template-based services that are currently leading the market. You look at all the reasons why industry leaders are predicting that Mad Mimi will topple the current dominating players in the email marketing industry, and many of those reasons can be credited to the influence of 37signals' products. In terms of how we use Basecamp, it's interesting. Before our success in email marketing, we were just another New York music production company. At the time, Basecamp let us exchange music files in a cool way. As artists, we were taken in by what we all called the "Basecamp Vibe," which meant beauty, economy, simplicity. As a company, we had to promote ourselves with email, and we hated the web based apps we found — they were charging quite a lot for the pleasure of using the same tired, dated templates. So driven by necessity, and inspired by the "Basecamp Vibe", we put together (collaborating with Dave Hoover and his team at Obtiva Studio) a new way to design, send and track our own e-promos. The software was so effective it became our company's main focus, and that's when we brought in big guns like Tobie Langel to bring it to surprising new levels. What's interesting is that we used Basecamp for managing the collaboration of our team in Chicago, Utah, Switzerland, South Africa and New York in developing our software. In short, Basecamp is a muse...that we use. Some months it's one feature, some months it's another. It's a constant process of discovery. For a long time we stayed away from the To-Do lists, and favored only messages. But now To-Do's are a daily routine. There's a tremendous gratification in crossing off tasks and having that "wow, look at what I accomplished" feeling. Before Basecamp it was an endless swarm of disorganized emails. I just remember a lot re:re:re:re. There were phone calls, conference calls, cell phone headaches, and the time-eating in-person meetings. Our feeling is face-to-face should be over a relaxing lunch, not over papers. Basecamp actually saved us time, and we were able to enjoy more of those lunches. We used Google Docs on occasion before we switched. Basecamp is more fun, easier, nicer to look at, and seemingly bug free. We still use Google Docs for various odd tasks, but coming back to Basecamp is like coming home to a comfy arm-chair or an old pair of jeans. Well, to begin with, Basecamp helped us out with EVERYTHING. We went from technological imbeciles to technology newbies in no time. Basecamp is much more than a simple app. It was our ENTIRE BUSINESS. Our offices, our conference room, our file cabinets, our calendars, our traffic department, our bulletin board, our lounge, everything. Our team was based in five different cities, so we have to credit Basecamp for taking Mad Mimi from infancy to the launch of a groundbreaking product. Learn how Mad Mimi uses Campfire for customer service after the jump. 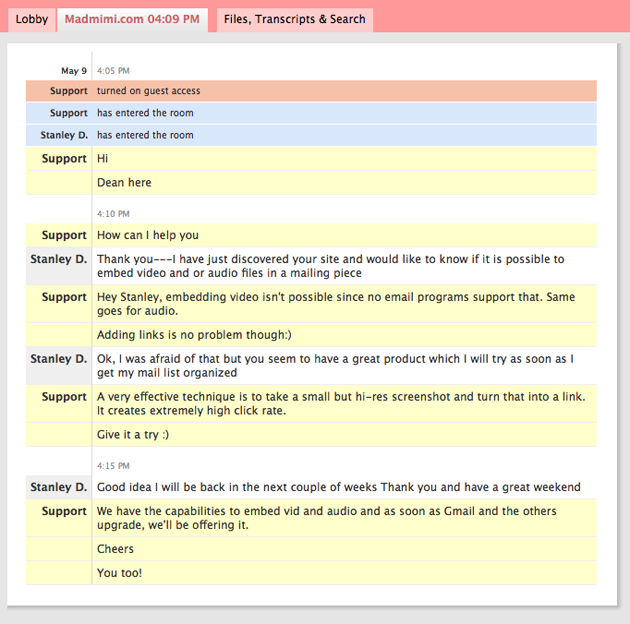 "Mad Mimi's Chat that allowed me to send files and screenshots has made me feel like I was being helped by a real person. It took Mad Mimi's website to a new level. I could not be more pleased with the service I have received and I believe Campfire was a large part of my experience." "I was really under the gun, getting a promo out on deadline, and I couldn't figure out why the pics were loading so slowly. I went on the chat support, typed my question, and hoped for a miracle. Lo and behold, I got an answer within 20 seconds...my pic was too big. Someone at Mimi told me to send the pic and offered to re-format it. That's great service." "I found Mad Mimi – they had a website that was very impressive and professional...the only major issue was their distance – I'm in Uganda and they are on the east coast. I was concerned I would have trouble contacting them when I had an issue, and feedback loops that happen with big time zone gaps...it's usualy a nightmare. Then I clicked on the little yellow Chat button and saw a little Campfire icon. I was able to chat with an expert while I was composing my promotion. It felt like a premium luxury, yet it was totally free. Looking at the other companies I subscribe to, I don't know why they all don't use Campfire. Thanks for sharing Gary! Do you use a 37signals product in an interesting or noteworthy way? Let us know. Video: Backpack tips for dragging This video shows you how to use the Home/End and Page Up/Down keys for dragging items around a Backpack page quickly. Also, you'll see how easy it is to drag an item to a page in the sidebar.